Below was an image put on FB by a male friend of mine. Of course the females went crazy liking his stat and chiming in that any woman that does not wear “natural” hair has a problem with her heritage and a low self-worth. But tonight, I could not keep my peace. Here is my response. Hate it, like it, or love it…it is for some…an explanation of the other side of the perceived ”White American Acceptance” rainbow. 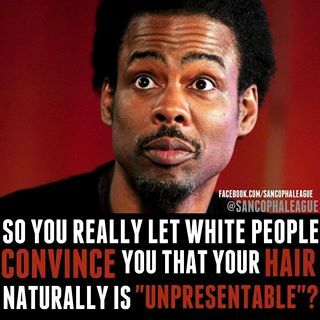 I never understood why those that choose natural hair think that those that don’t make that choice have some sort of inferiority complex or hatred of themselves or their skin color or heritage. Some people prefer blue, some like black; some prefer makeup, others prefer natural. Some like chocolate, others prefer vanilla; some are vegetarians, some like meat; some women only wear dresses, others like pants; some think heels are the end all be all, while others wear flats. In the end it is just a matter of choice, and that choice isn’t always as white and black as people want to assume that it is. Why do people assume that if a black woman does not go natural with her hair, then she has some sort of hatred toward her people, her race, herself or who she is as a person? Why can’t hair — and the way a woman prefers to wear it – be treated in the same manner that it is for some…just an accessory…Not as a characterization, a category, a definition of self-worth or any other statement? Why can’t her hair choice be the same as a scarf or a bracelet or a pair of earrings? It’s an accessory to an already flawless creation of God; but one that we, as people, tend to accentuate in one form or fashion according to what we, as individuals, like. Why must it be a representation of how the world views her self-worth and a categorization of who she is as a person, when it may truly just be an accessory of what she likes? If an AA man chooses to go bald, nothing is said about him forgetting his roots or his heritage, nor is he labeled as giving in to what White America views as acceptable. His choice is not associated with what the white man finds acceptable, but is merely shrugged off as his personal choice, regardless of the circumstances, choices, or reasons. He can do so because that is the way he likes to look and his hair choice does not come into play concerning his loyalty to his people or his heritage. Why, when it comes to women, must it always be about “representin’” instead of doing what we like? Why can’t a black woman’s hair style be just that….her hair style…without it being associated with some sort of racial or self-hating connotation? If I buy a brand name purse because I like the purse or a pair of shoes because I like the shoes…that’s okay…but if I don’t wear a natural hair style, then I am allowing White America to dictate what is beautiful or am guilty of not loving myself as a person? Is it really that black and white with no grey area in between? The natural way is the only way? Ye of small judgmental minds really should catch a clue. Nothing in life is that black and white. God is not a God of a cookie–cutter mold. Everything HE makes is an original. I’ll do me and you do you; and something tells me that in both of us doing so, our Father will be pleased. Call me a weirdo because I never gave into the philosophy that my hair dictated or defined my self worth…and I never will give in to that philosophy. I am the bi-product of several ingredients…hair only being a small, insignificant one of many. I wear what I wear from hairstyles to clothes because I like them. Plain and simple…no other connotations need to be associated with that fact. And in doing all of it…it has no correlation to my self worth or my pride in my heritage. It all has to do with what I like, at that moment in time…plain and simple. No brainwashing here on any regard. Both the blessing and the curse of encountering a middle age woman is that she knows WHO she is, WHAT she wants, and the fact that she has zero problems in articulating her journey to obtain her goals and desires. Much like any war, there will be casualties. She makes no apologies concerning the fabric of her being, because she recognizes it is hand-woven by God and luxurious in design. Games are for children; and thus are no longer an accessory she possesses or wears. She recognizes life is precious and too short for her to be a jockey riding around a circular track. Every saddle she bounces on leads to her satisfaction and victory, or else it is abandoned. I am finishing up an editing project and deeply immersed in a genre I rarely, if ever, read. I am pleasantly surprised. It started me thinking about how many things in life we brush off because it is not what we “think” will suit our taste or will have value to us. There are so many things in life that we dismiss because it is not our way of life or our way of doing things. But in living in that mentality, we miss some true gems. This project has been a “marinating” moment for me about all things in life. I challenge you, as I challenge myself…open up your minds to things outside of your normal way of thinking. Allow your mind to run free in the unknown. In unleashing the curious child inside of you, you just might find a wonderful world that your jaded mindset has been keeping you from enjoying. Recently while at the National Black Book Festival in Houston, I spent time with my lovely label mate, Cheryl Lacey Donavon. As we both prepared our author tables in a manner that would be aesthetically pleasing in the eyes of the festival attendees, I noticed that Cheryl had copies of “Our Daily Bread” on her table to give to those passing by. When I asked about them she said, “Here, take one. Let’s get some more of the ‘Word’ up in ya!” I smiled, took the small pamphlet and while it did make it home to Austin with me, it only made it to a stand next to my laptop. No further. No pages opened. Not a word read for days. After all, I had only taken it to appease Cheryl and avoid a loving slap upside the back of my head from her. I paid way too much for these braids; I couldn’t risk her making one fall out. A few days later, while responding to an email about guilty pleasure beauty regimes, I shared with my online girlfriends that I NEED pedicures. I explained that I’m hard on my feet and do not give them the attention they need. Yes, I’ll admit it…Deeva has ugly feet! There, I said it. Now run, tell THAT! After my online confession, I looked to the side of me and that little pamphlet seemed to be screaming at me. It said, “Didn’t you hear me the first time…I said, “I WILL NOT BE IGNORED!” Scared of a slap upside the head by a hand much larger than Cheryl’s, one that holds the heavens and the earth, I figured I better obey. So I picked that small book up and flipped to the message for the day. Peacocks and their Kin. That was the message. It started off explaining how beautiful male peacocks are with their blue-green plumage and colored eyes in hues of gold, red and blue. It said that they are beautiful birds, but…they have ugly feet! Hummm, I guess that puts me in the peacock ‘kin’ category. I know what to say or think when a person steps on my toes…but how do you respond when God does it? Inquiring minds still want to know the answer to that one. The message went on to say that God often chooses us to accomplish His works and to display His gifts despite our imperfections. All I could do was look to the heavens and smile. Go figure that! I said out loud to myself. Suddenly reality took its turn in slapping me. 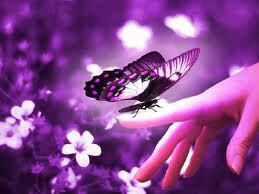 See most of us, at some time or another, feel; week, unworthy, or limited by one thing or another. We all have our moments when all we see is the ‘ugly’ despite the colorful rainbow that resides within us. But what we really need to focus on is our kinship to the peacock with the ugly feet; we need to recognize that something about us was uniquely and exquisitely made for greatness. So what if you’re not the prettiest, the strongest or the best. So what if you have crooked teeth, no education, a physical limitation or talk with an accent. So what if you come from the poor side of town, have limited resources, or haters lined up a block long waiting to see you fail. So what if you are like me and have ugly feet. So what! So what! SO WHAT! That doesn’t change a thing. Just like the peacock, you’re beautifully and wondrously made – Imperfections and all! When it comes to your destiny, “One monkey don’t stop no show; even if that monkey is YOU!” Don’t be the last one to know what God has been trying to tell you all along. It takes imperfections in each of us for the perfection to show. So walk proudly into your destiny, and do it with your imperfections in tow. Take it from me, being hard headed won’t stop a message from getting through, especially when it is destined to be delivered. Own the responsibilities associated with your blessings! Nothing in life comes without a price. We don’t always want to hear that, but it is true. Even if you are blessed and highly favored, it does not come without a price. “To whom much is given, much is required.” Remember that. As you sail along in the good times, be cognizant that there is a toll for your blessings. Usually it is unspoken, but still required. You are blessed so that you can pass that blessing on to others. Neither your trial nor your triumph is yours alone. They belong to others as well. Your deliverance brings with it a responsibility. That responsibility is to share, to teach, to encourage or to inspire. With each blessing you receive, remember it comes with a responsibility and as you enjoy the rays of sunshine in the blessing, don’t forget to live up to your end of the bargain! demands that do not respect my value or my time. things—in my personal rear view mirror. in the form of perceived entitlement and subtle disrespect. all just a bad dream. mental tormentor of the night. For the last couple of weeks, I have been watching the show the “X Factor” trying to decide if it would be my new reality show of choice. I was riding the fence on whether I would be a fan or not and the crucial moment that nailed it for me came at the end of the boot camp episode. Four different groups of people would be told if they had what it took to make the grade. The contestants would hear the words of whether they had the coveted “X Factor” that meant they were worthy of sharing the voice God gave them with the world. Night-time television is designed to bring drama, raise blood pressure, and build anticipation; but real life isn’t much different in what it delivers. It’s all the same; whether on the small screen or within the walls of an individual’s own reality. My eyes were glued to the set; as boys, girls, groups and my personal favorite, those over 30, waited to hear whether they would be given – yet ANOTHER chance to prove that they were worthy of living up to the world’s expectations and requirements of being able to seek out a destiny of living out their dreams. As those that would proceed to the next round were announced, tears of grateful acknowledgement fell from each of their eyes and from mine as well. I celebrated their joy with them. I felt their emotion and experienced their excitement – all the while relieving my own personal experience. The X Factor…society’s nod of approval that you are being given a CHANCE to prove your worth, one mo’ gin (as they say). It’s the heaviest cross to bear on the shoulders of those that stand naked before the world with attempts to entertain it. It’s that “Showtime at the Apollo” moment where you either win over the crowd, or watch in shame as the sandman comes with a large hook and pulls you off the stage of your destiny amongst hands waiving back and forth in the air shouting for your immediate demise for wasting their time. The X Factor…a nod of acceptance to follow your believed talent or craft…receiving it is a feat that few try to accomplish and one at which most fail. But the power of that nod means the world to the receiver. While not a guarantee of anything at all, and really is only a mere moment in time of one’s life…the possibilities associated with the nod, has a power like none other, to soothe the soul of those that chase after it. I wasn’t in the arena that the ‘X Factor’ contestants were in that night. They are not my family members or friends. I do not know any of them from Adam. But I felt their anxiety. Wow. That feeling is priceless. No matter how many breaths I take from that moment until my last, will compare to that moment of taking my breath away. Just like the air around each of the contestants on the ‘X Factor’ stage will forever be different from the air they have exhaled all of their life up until that moment and the air that they will breathe from now on. That air is different. It has to be. It’s blessed. It’s more fulfilling. It is unknown who of those that advanced on the show will ultimately have what it takes to make the ultimate grade of approval by society’s standards. Much along the same lines is the mirror of my path as an author, for it is still unforeseen as to how things will play out for me in the long run. But for that brief moment in time, I know that I felt the magic and I can only assume from their faces that they did as well. For a moment in time – I shared their journey, I had much appreciation for their efforts, and I was extremely grateful, along with the contestants on a simple reality TV show, as we all said thanks to those that threw us a bone of confidence in furtherance of our efforts to share our “Voice” with the world; and as each of us continually seeks a path of trying to develop the “X Factor” that allows us to attempt to entertain the world one more time. All writers have experienced it. It’s that warm fuzzy feeling of joy when we’ve written something that we know is good. It’s that feeling of giving birth to a creative or thought-provoking piece. For some, it’s a piece they wrote as a child, their first moment of self expression that they will never forget writing. For others it’s a first poem or completion of the first chapter of what will ultimately become their debut book. And yet still for a different sect of people it’s the sale of their first book, a moment which solidifies in the writer’s mind, more than anything else, that they are truly a writer because someone is willing to shell out hard-earned cash to read the words they have connected together. No matter what stage the feeling comes, it is still felt by ALL writers and there is nothing like the experience of your first time. Since the debut of my novel, Mistress Memoirs, I thought nothing else could compare to “that” feeling. Nothing else could bring me the same joy. But each experience as an Author proves me wrong. Each night I write, as I compose my next novel, and as I stare out my bedroom window into the night, allowing the stars to be my inspiration as they guide my fingertips across the keyboard, I get “that” feeling as if the new book is my very first. Each time I have a book signing and a reader has the look in their eyes as if they have just purchased a precious keepsake, I think to myself, “This is what makes it worthwhile” and my heart is filled with “that” feeling once again. And in the midst of these experiences, I ask myself why do I write. And each and every time, the answer is twofold: I write because my soul says I HAVE to and I write because there is extreme satisfaction in entertaining others. It’s a win/win situation for me. It’s at that point that I realize that when releasing my muse, I get the same gratification I received when initially stringing my first thoughts together in written format, and that makes me smile. The long nights of writing, knowing I will pay for it in the morning through fatigue are worth it, because it’s fulfilling, and ultimately, for me…it always feels like the first time.